With over 700 million active monthly users, Instagram is the 7th most popular social media network in the world. Growing a large audience on this platform isn’t an easy feat, and those who already have followers are always wondering how they can keep their attention. Growing an audience on Instagram doesn’t require magic or luck; It takes consistency, and attention to detail. Follow these tips and you’ll be well on your way to building a large base of followers who love your content and engage with your brand. If you have a business name or blog try to create an Instagram username that is the same (or as close to) your business name so that it’s easy for people to find your social profiles. Set your profile to public so that your posts are discoverable through hashtags and in search. Use the bio to briefly tell people who you are and what they can expect from your profile. Add your website in the bio link. Before getting started decide on how you want your content to look. The best Instagram accounts have a particular look and feel to them, often evoking a specific emotion using carefully chosen filters and colors. Hashtags are topics that tie the whole Instagram community together. If your account is public, and you add a hashtag to your photo or video it will show up in a stream when other users search for that hashtag. The content is shown to followers, and non-followers alike, so using hashtags is a great tactic for increasing your profile’s visibility. Using too many hashtags, or using the same ones too frequently, can attract spam followings, or can stop your content from appearing when searched. Perform hashtag research to learn which hashtags will perform best for your industry, or brand. Use the Instagram “explore” tab in the app to see a list of related hashtags at the top of your screen, when searching for hashtags. 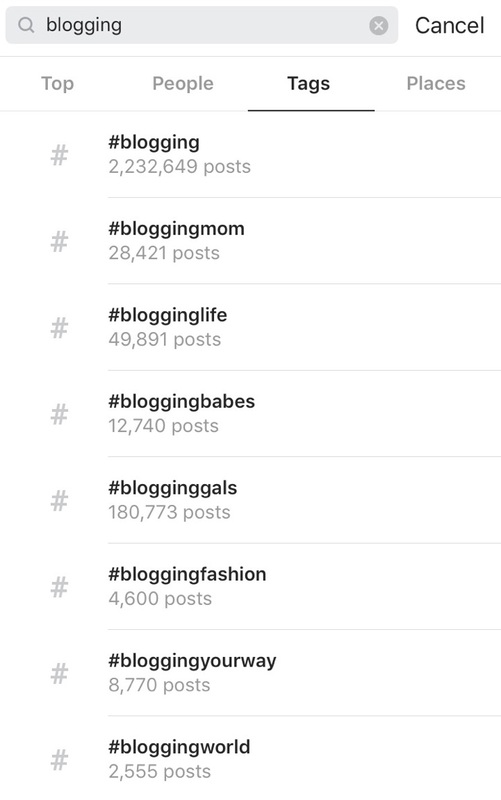 For example, when searching for #blogging in the Instagram app, it shows relevant hashtags like #bloggingmom, #blogginglife, and so on. It also shows how popular the hashtag is with the number of posts with that hashtag. Read more about the FTC endorsement guidelines here. Human interaction is what turns followers into an audience. When you frequently respond to questions and comments on Instagram your audience will feel more personally connected to you, can learn about your brand and the products you promote. Don’t let questions go unanswered! Share moments throughout your day on Instagram Stories (content that only lasts 24 hours before disappearing), and take advantage of Instagram Live videos. There is nothing more rewarding than chatting with the people who see your content and respect your opinion. Thanks to smart phones and social media it’s never been easier to start broadcasting live to your audience, and having important conversations about what you know best. Want To Join The Acorn Influencer Network? Acorn, The Influence company is always looking for new talent to join its influencer network. If you think you have what it takes to work with some of the leading brands in the world, follow this link.